Sudden, acute injuries are inevitable, no matter your level of exercise. Whether you’re an athlete getting knocked down on the field or you just slip on a patch of ice, these specific, localized injuries can be mild or severe. You can’t always get top of the line health care to treat these injuries, so taking steps at home to treat an acute injury is quite normal…but are you following the best protocol? The mainstream belief for treating an injury has led people to believe that the best steps to take are rest, ice, compression, and elevation - otherwise known as the R.I.C.E. protocol. While these steps have been the most popular way to treat acute injuries for many years, they’re not necessarily the best way to optimize healing. R.I.C.E. is designed to reduce the inflammation that occurs after an acute injury, which can be great depending on how much swelling there is. The problem is, blood flow (inflammation is increased blood flow as a reaction to injury) is how our body heals. So why are we trying to prevent it? This is where the M.E.A.T. protocol comes in; this stands for movement, exercise, analgesics and treatment. This protocol is centered around active care and implementing movement as soon as possible. M.E.A.T. increases the flow of blood to injured areas in order to enhance the healing process. 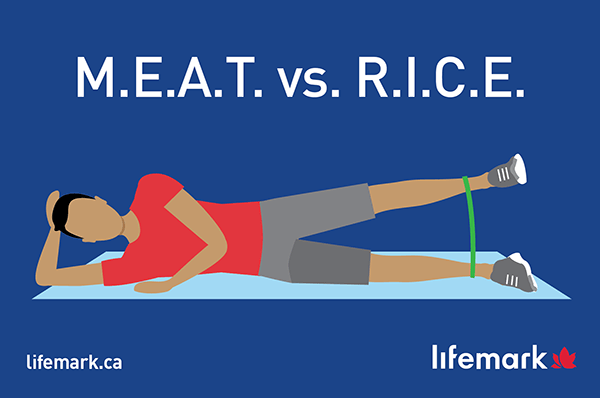 Soft tissue structures such as ligaments, tendons, and cartilage don’t get a lot of blood supply to begin with, so reducing blood flow with R.I.C.E. will prolong healing. For example, not having a completely healed ligament will increase the likelihood of having chronic instability of a joint. This can be a big problem with athletes. Movement: It’s vital for this gentle movement to be at pain tolerance. Movement is key because it puts a small amount of load on the ligament, accelerating the new tissue to grow in an organized fashion. Movement also enhances flushing of lymph and blood. This removes debris and brings in new nutrient rich blood. Exercise: This is implemented once the pain levels have decreased and movement of the injured area increases. Exercise can be focused on extended or shortening muscle, depending on the injured structure, but always within the pain boundaries. Exercise will further increase circulation adding fresh blood and removing debris from damage tissue. Analgesia: This is where nutrition advice and herbal recommendations can help give natural remedies for pain relief. Natural pain killers that have been known to help manage pain include ginger, turmeric, capsaicin, valerian root, magnesium, and boswellia. However, it takes a consistent intake to start feeling the results. Treatment: Implementing early passive and manual therapy depending on how acute the injury is. This can range from joint mobilization, acupuncture, soft tissue release, laser, ice, heat, TENS, etc. Every injury is different and needs to have a certain strategy when using passive and manual therapy. Lifemark therapists are true believers in early active care to promote healing and enhance the overall outcome of treatment. Our goal is to provide the best possible treatment to relieve your pain and get you back in regular shape. Don’t let pain keep you from doing what you love. Head to your local Lifemark clinic for a consult and we’ll getting you moving better and feeling great!